Below is a chart that outlines the positional designation for the majority of draft-worthy IDPs across the top league management systems. 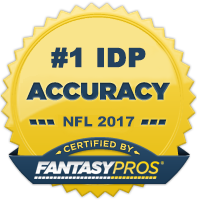 Typically, the position a specific IDP qualifies at is consistent across all league management systems. However, there are certain instances when sites disagree on how a player should be classified (or are just to lazy/uninformed to properly update). IDP owners should be aware of these discrepancies in order to take advantage of them when appropriate. Most often, owners will find the most value in seeking out players who function as a linebacker within their team's defensive scheme but are classified in a particular management system as a defensive lineman (e.g. Trevor Scott in 2009). The sites listed below have become more uniform in their classification process over the last couple of seasons, but there are some instances where owners can squeeze some extra value out of players. All players who have differing classifications are highlighted in red. Players are grouped into specific tabs based on their position designation within our 2012 Fantasy Football Draft Guide.